Oh, sweet Summer time. 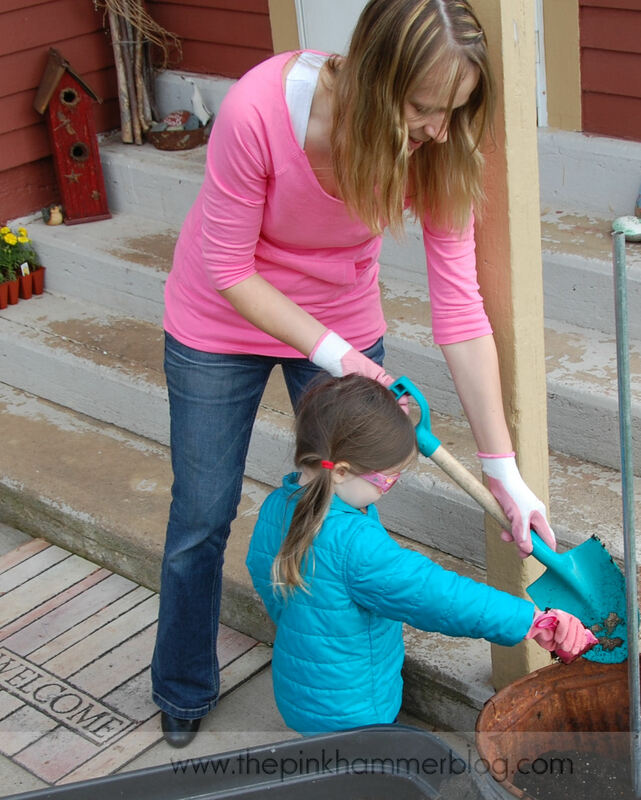 The sounds of bees buzzing around the yard and the laughter of children fill the air, the grass is warm on your toes and you are ready to plant some flowers, but aren’t sure what to plant to be different from every other garden on your block. The tipsy pot planter is a great Do It Yourself project anyone can do, with just a few supplies and a bit of a green thumb. Using these simple steps below, you can create your own primitive tipsy pot planter! 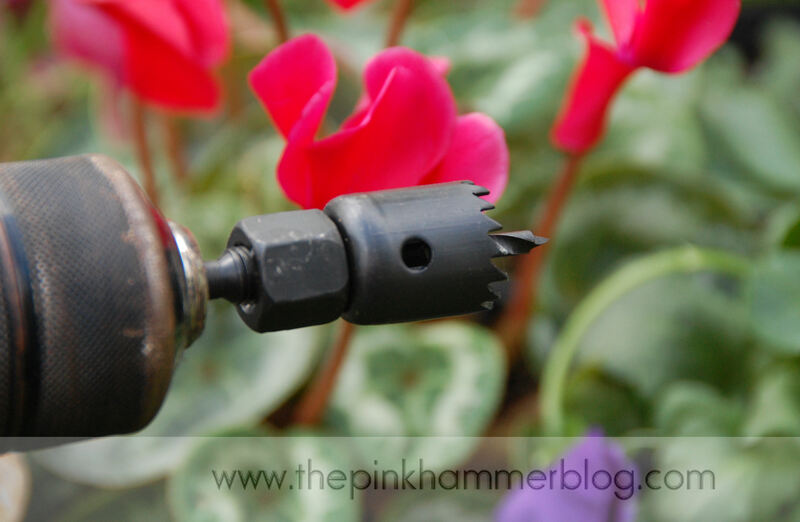 Project Supplies: Flowers, Potting soil, Primitive pots, 1/2″ steel conduit |Project Tools: Drill, 1″ hole saw. 1.) Pick the location where you want your tipsy pot planter. I chose to place mine in a place where the grass has never really grown well, right near my main entrance, which makes a great way to greet guests as they come for a visit. 2.) 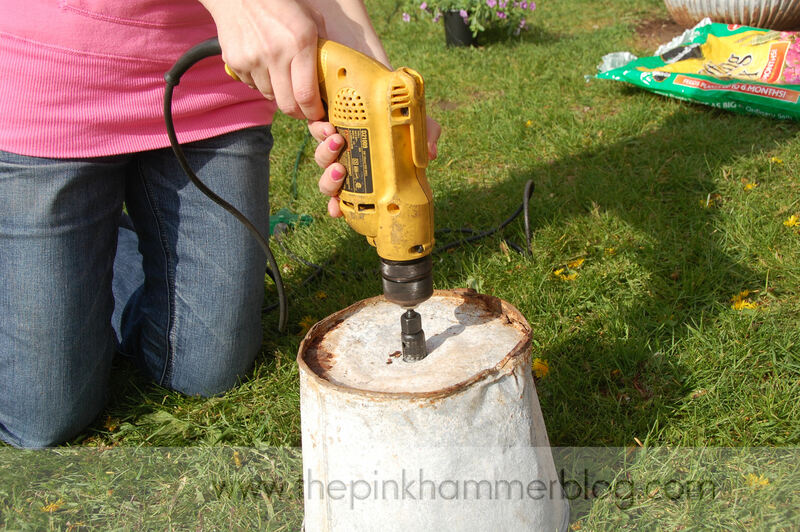 Drill holes into the bottom of each pot. If you are using the 1/2″ conduit, you will need to drill a 1″ hole in each pot. This is what allows the pots to tip from side to side. 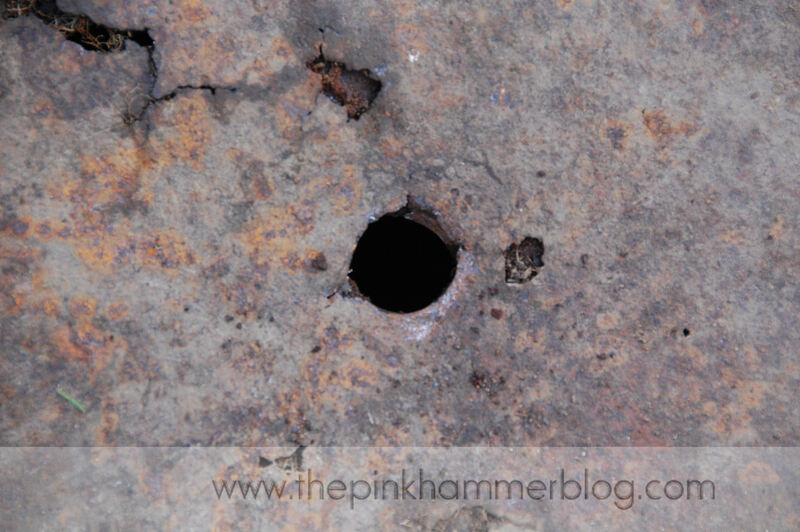 I used a drill with a 1″ hole saw attached. 3.) Place your first, larger pot in the location you desire. 4.) 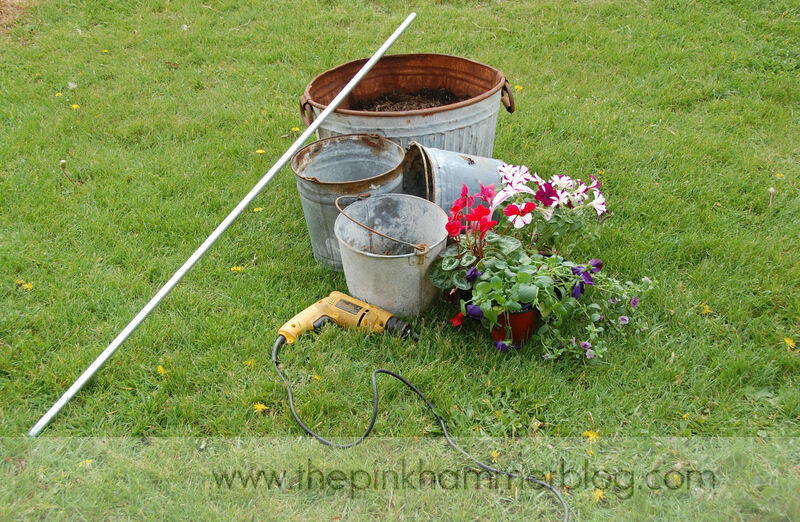 Push your conduit into the ground, through the hole you drilled in the larger pot & fill your pot with potting soil. 5.) Continue stacking your pots, tipping them as you go, along the way. Fill them with dirt and whatever flowers your little heart desires. 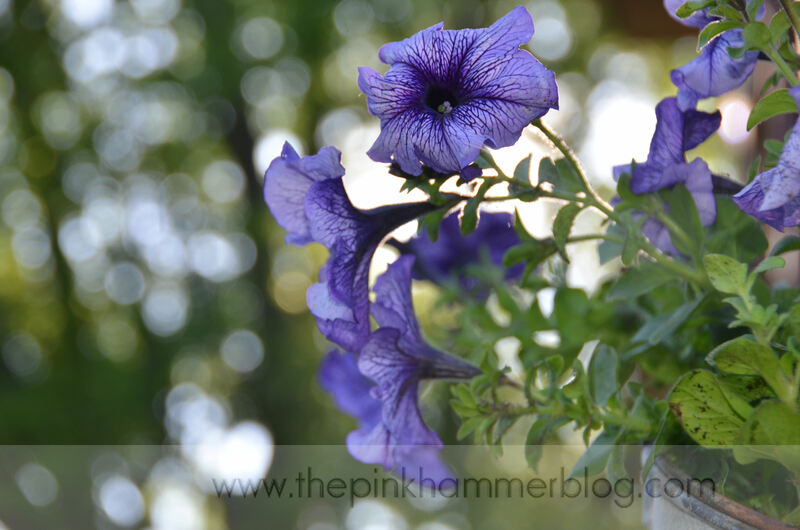 I mainly use flowers that will grow and eventually drape over the edge of the buckets (ivy, vinca vine, petunias, Calibrachoa etc). Your steel conduit should be even or below the top tipsy pot, if needed, give it a few good pounds to push it down into the ground farther. 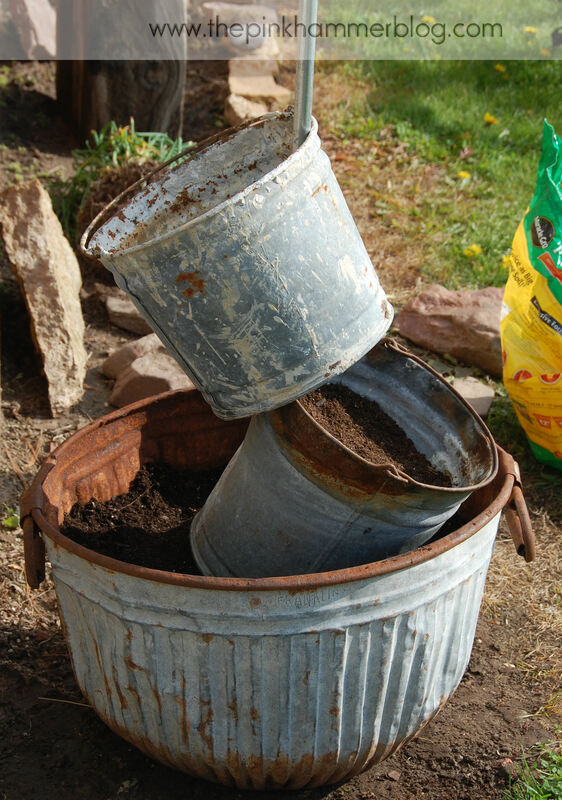 Pack your soil nice and tight into the first pot, as the rest of your pots will be resting right in the larger of all the pots. The more rust your bucket has, the easier it will be to drill through. *You can also read this blog post in the June issue of Queen of the Castle Magazine online , or pick up a copy at a local business. Categories: Antiquing/Thrifting, Design, DIY, Gardening/Yard work, Home Design/Decor, Primitives | Tags: DIY, DIY tipsy pot planter, garden decor, how to make a tipsy pot planter, How to upcycle old metal buckets, primitive garden decor, primitive tipsy pot planters, Tipsy Pot planter, tipsy pots, unique flower planters, unique garden ideas, Upcycling, yard decor | Permalink. Well, as if a move & family doesn’t keep you busy enough…..look at this wonderful project! Thanks Kari!! :) T minus 19 days until we move out of this house!! Then the real adventure begins! Wow there is an after life for leaking buckets. Best planter I have ever seen. Great job. Bet this could even work for Strawberry plants. Thanks D 🙂 What a great idea-the strawberry plants, I will have to remember that and try it someday soon! 🙂 Thanks for reading! 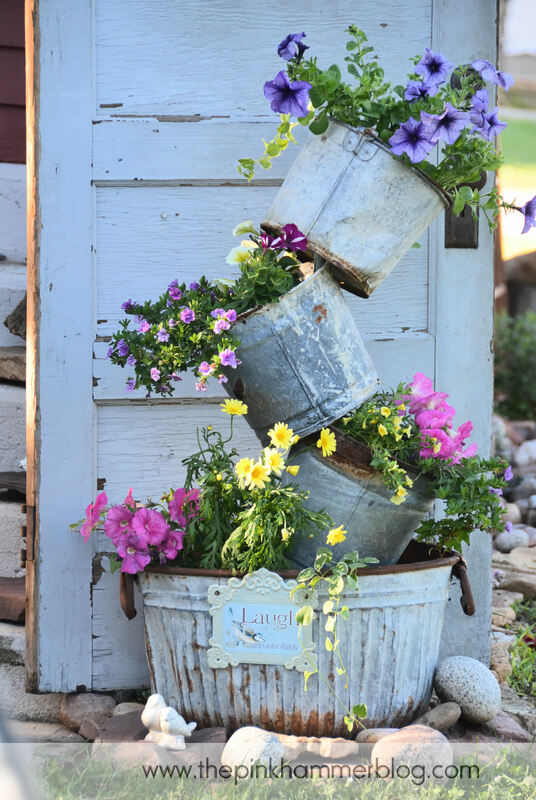 I was going to do this with clay pots but yours is much much nicer – must go find me some old pots now! beautiful job!! luv this idea…have some chippy white enamel pots just waiting to become tipsy!!!! Thanks Rhonda! Have fun creating your own tipsy pot planter! 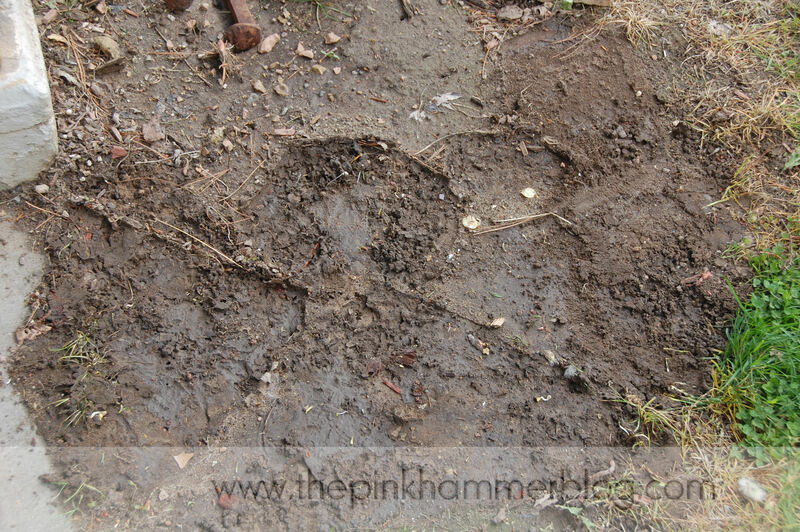 Find The Pink Hammer on facebook and make sure to post photos of yours when complete-Id love to see! Thank you for sharing your whimsical planter with us……it is rather delightful. That is just a fun and creative idea! 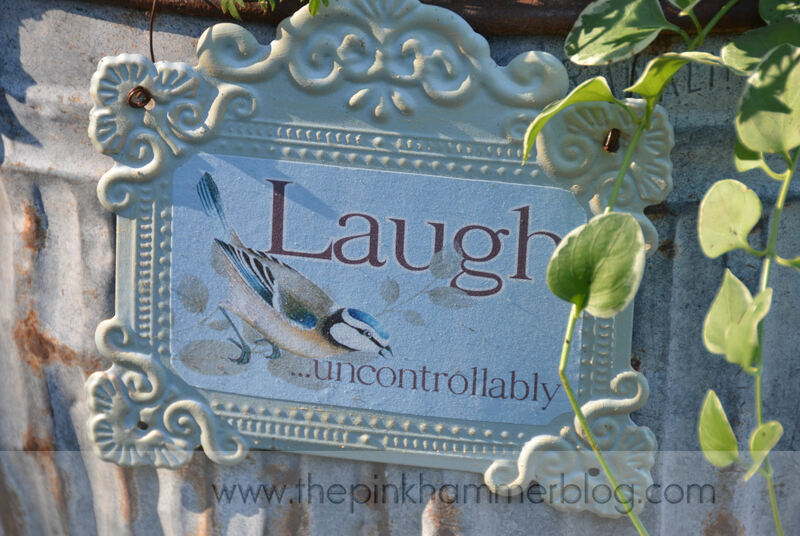 I love a little whimsy in the garden! love it, can’t wait to make one of my own. Hi Jamie! Thanks so much for reading, enjoy creating your own tipsy pot planter-they are so fun to create! Just popped over from Inspred by Charm, and I am loving this!!! You’ve made this project look so easy to put together. I’m keeping my eyes peeled for old metal vessels to create one of my own. Thanks for sharing this great project. I look forward to checking out more of your projects. Amazing! I’ve got a base, just need to keep my eyes open for more galvanized goodies! Thanks for an amazing project. Oh goodness… you have no idea how much I LOVE this! I hope you don’t mind me sharing you on my FB page. Found this through Michael! Found you through Michael at Inspired by Charm. And this planter is absolutely charming! Yard sales here I come a lookin’ for the perfect vessels. Now to read through the rest of your blog! Stumbled upon this and love it!!! I had been collecting old pails for years. They sat in my basement just waiting for the perfect project! I completed mine yesterday. LOVE it!!! Even my husband and son were thrilled with the look. Hi Kelly, love this! 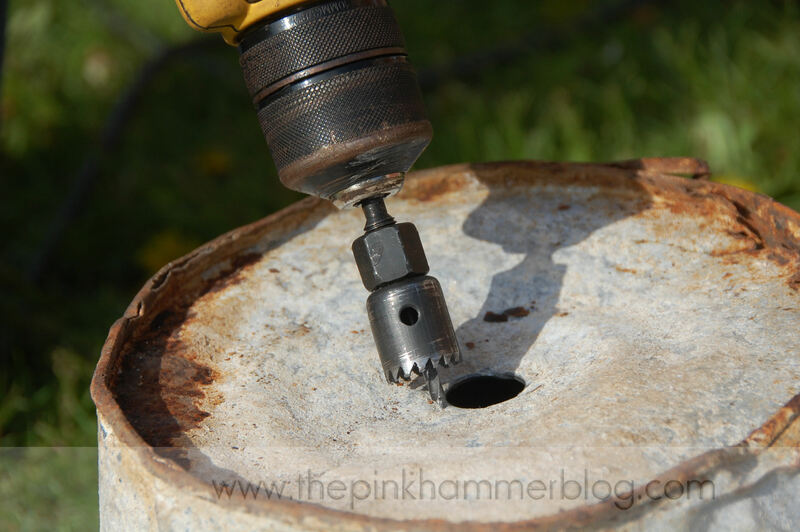 Do you drill the holes in the center on ALL buckets…or to one side or the other? 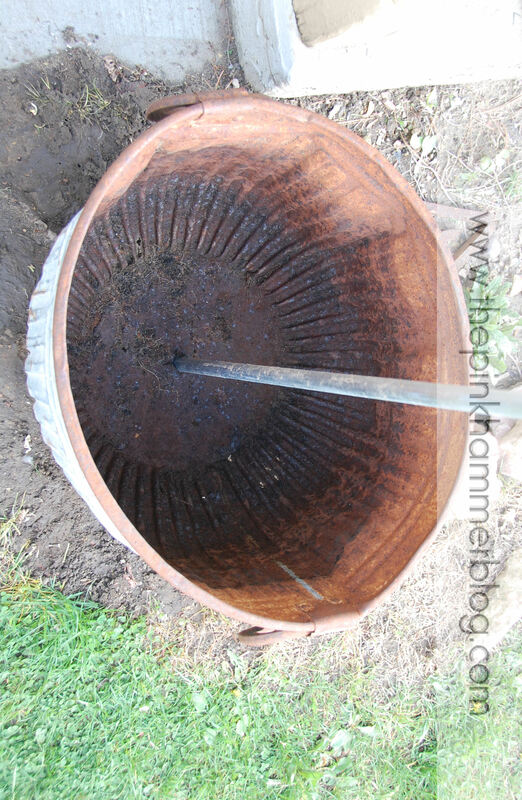 Drill the holes in the center of each bucket. Love this so much, I couldn’t wait to find rusty buckets. I actually found one, but I bought the tub and another bucket at a farm supply store. For the top I wanted to use a metal watering can and I found one at a flea market that had flowers painted on it and I tipped that to make it look like it was watering the planter. It turned out perfect. Thanks for an awesome inspiration. Jill, any way you can post a pic? Your’s sounds great! 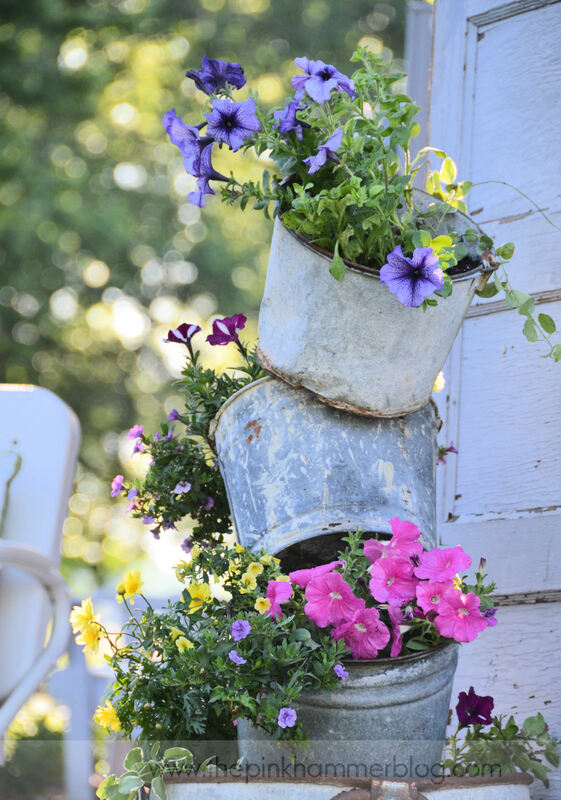 I love, love, love your pretty planters and I’m collecting tins like yours to make my own! I do hope they turn out as lovely as yours are! I’ve got this linked to my planters post as well today, for inspiration! I love this planter. I particularly like the idea of several containers in a vertical space rather than horizontal. Fantastic! Great Idea! 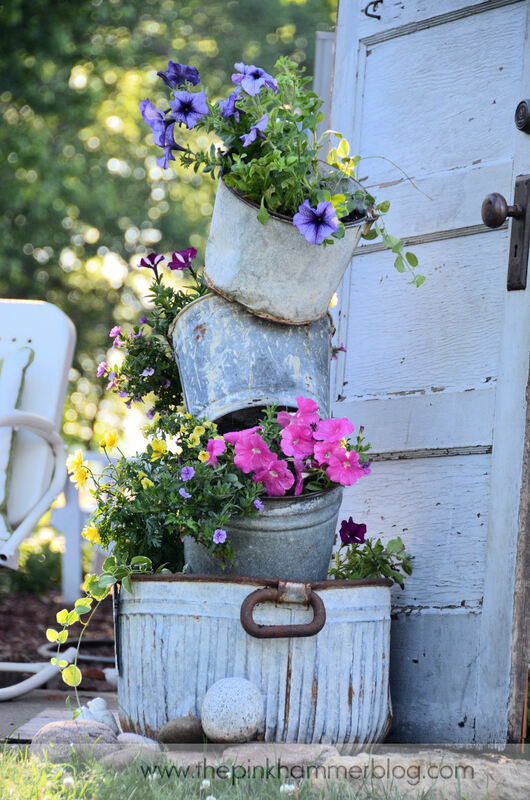 I’m lovin’ this tower idea for my old rusty bucket collection…..might start with strawberries. Oh ! how wonderful your new creation is !!! I love this, and am so glad the “Two Women with a Hoe” shared it on Facebook!! I’m going to try making one, though perhaps not till next year, as everything is burning up here in Kansas this summer! Reblogged this on The Adventures of Thrive Farm. Love this idea. I am doing this for sure next spring. 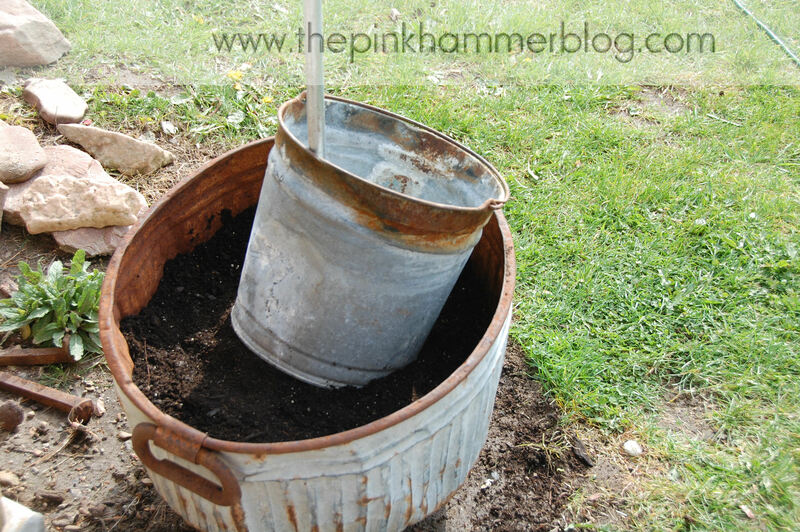 Being a rusty old lady I have lost of rusty old buckets to make it and a rusty old husband to help me. I like the idea to put a watering can on top and I just happen to have one of those laying around. Thanks again for the idea and the instructions on how to do it. I never could have figured that out. Learn something new every day. This is such a fun and beautiful project. Thanks so much for sharing your tutorial! Just fantastic. Can’t wait til spring. Rustic garden decor. � The Pink Hammer Blog” was in fact superb. Oh my! I can’t wait to try! I was wondering if a good long stick of bamboo or other wood might work instead of the rebar? I have a neurological condition leaving me permanently disabled. I have to steer clear from heavy metals and wonder if the metal in the rebar might be a problem if I grew edibles in it. Just wondering if the bamboo would be strong enough to hold if far enough into ground? Hello! Yes I absolutely think something like bamboo or a wood dowel would work, just make sure it is far enough in the ground to hold strong. Love these pots! Thank you! I personally needed to present this particular blog, “Primitive tipsy pot planters | DIY Rustic garden decor. | The Pink Hammer Blog” skidki-goroda together with my own buddies on twitter. I actuallysimply just needed to distribute your very good publishing! Adorable idea!!!! You are so clever!!!! Thank you so much for the instructions on the Tipsy Pot…they were flawless! I made mine yesterday and it came great, I am so proud of it! It took some searching around the Antiques Fair for buckets, a piece of rebar from the hardware store and beautiful flowers from Home Depot! Viola! Hello, I just acquired quite a collection of older galvanized buckets and small troughs. I really like your version of the topsy turvy pots planter. I do not have a drill to make the larger holes that you used. Perhaps, I could use a large mail to pound a hole into them. I just do not want to damage the already weak bottoms. What would you suggest? What is a 1/2″ conduit? Pingback: 17 Rad Ideas for Container Gardening | Stewart Landing Co. Thank you for the great instructions on the tipsy pot. I just moved into a new place and I want to enhance the front. This is a great idea. Thank you!!! 🙂 Enjoy creating them! Can someone please tell me where to go to get these pots? Hi Darleen! Check your local Junk/antique stores, flea markets , garage sales, etc IF you can no find any no matter where you look, you may purchase them from me (for the cost of pots + shipping from Wisconsin) Thanks!